xxxx BMW 335Ci HARD-TOP CONVERTIBLE | Black Sapphire Metallic with Coral Red Leather Interior | The xxxx 3-Series is once again one of Car and Driver's '10 Best Cars' thanks to its smooth engines, supple ride quality and comfortable seating. It has been recognized by the magazine a consecutive 17 times, a Car and Driver record. The magazine notes "no other carmaker has quite managed to package these attributes as successfully as BMW, although many have tried." The xxxx 3-Series was also selected as one of The Auto Channel's "All-Stars." U.S. News says, ''there are many worthy competitors in the entry-luxe category these days -- and it's getting more crowded all the time -- but the 3 remains at the head of the pack." This beautiful hard-top convertible comes with a power roof, red leather seats, wood trim, push start ignition, dual automatic climate controls, rain sensing wipers, CD player with auxiliary Mp3 input, a beverage cooler, steering wheel controls, and power rear seat easy entry. 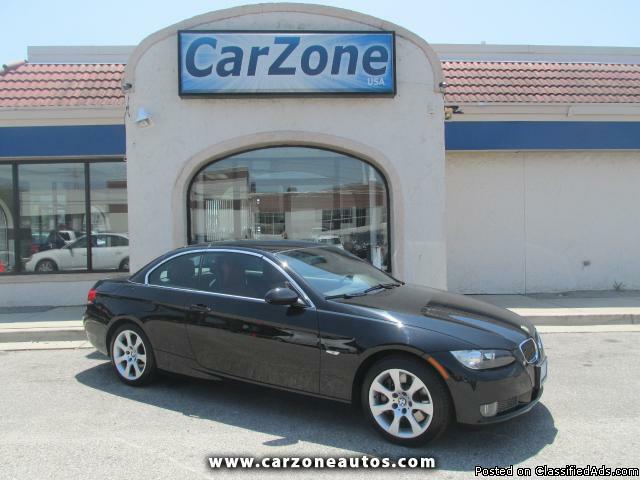 If you want a car that makes a statement this summer, the 335Ci is a car that'll turn heads wherever you go!